My siblings and I grew up loving kankanen, Ilocano of kakanin or rice cakes/delis. Our snack would always consist of these glorious native delis (well, other than our usual fruits and milo drinks and local bakery breads). Sapin sapin made by our Lola Esting is one of them. Our Lola Esting's sapin sapin is the best ever sapin sapin in our small town Tabuk. Too bad nobody among her children learned how to cook her kankanen specialties and I regret that I never had the chance to learn how to make these native delis from her. Sapin sapin is what Filipinos call this layer upon layer of of steamed rice cakes that comes in different colors and varying flavors. My Lola Estings sapin sapin comes in two colors only, a white and violet color. It only had one flavor, coconut ;-) and it was topped with anise seed and not toasted coconut. It was scrumptious. For two weeks, I had been planning to cook sapin sapin. Everything had already been laid out in my mind, how it would like and how it would taste like. Since I planned to post it on the Monday during the Philippine Independence week, I want it to highlight the colors of the Philippine flag - blue, white and red. 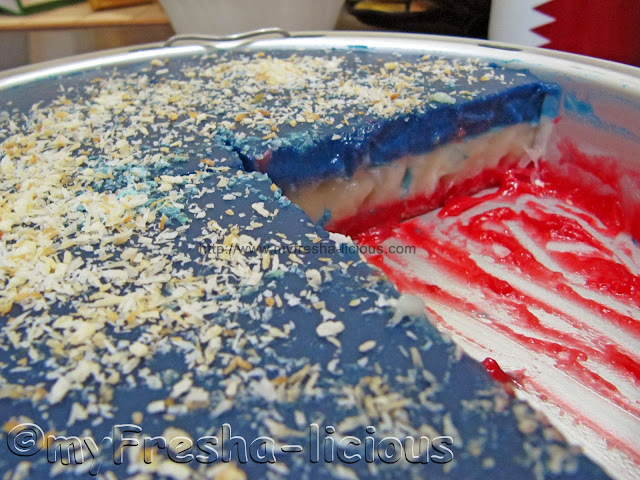 The flavors should be vanilla for the red layer, macapuno for the white, and ube (yam) for the blue layer. But my husband and I failed to find any yam flavoring so I flavored the blue part as vanilla. This is my first time to make sapin sapin. I had no idea whether to go for glutinous rice flour or rice flour or a mixture or both. I saw a few recipes calling for the use of glutinous rice flour so I went for that. And I cooked sapin sapin without even consulting my mother. I haven't seen or known her cooking sapin sapin before but when I was in Tabuk, we planned to cook sapin sapin that means to say she knows how to cook it. It was a regret on my part not to consult her first before proceeding. So there I used glutinous rice flour and my sapin sapin was too sticky that my husband cannot take it out from the steaming pan without ruining it. It was really a messy looking layered sticky rice cake. We cannot get a good looking sliced piece for a photo shoot so my husband decided to just point and shoot at what is left in the steaming pan. One other thing, though visually it looked messy because the sapin sapin was so sticky (I will try to find banana leaves next time or use a wax paper instead) the flavor came out to be good but not so great. My husband, after finishing almost 1/4 slice of my sapin sapin, said that the taste was ok but it left him with a sickening sweet taste in his mouth :-( I have to find a purple yam flavor or use pandan flavoring next time instead of vanilla. I will also reduce the use of the coconut powder, I believe that gave a cloying taste in my sapin sapin. 1. Mix the first 5 ingredients together until homogenous. Divide into 3 equal parts by placing into 3 bowls. 2. In a double boiler, boil water on the bottom pan/pot. 3. Red layer : In one bowl, mix 1/4 tsp of vanilla powder and 1 tsp or more of the red food color. Pour it in the steaming pan. Steam until it is set. 4. Macapuno Layer: Mix the sweetened macapuno with the batter and mix well. Pour over the red layer and steam until it is set. 5. 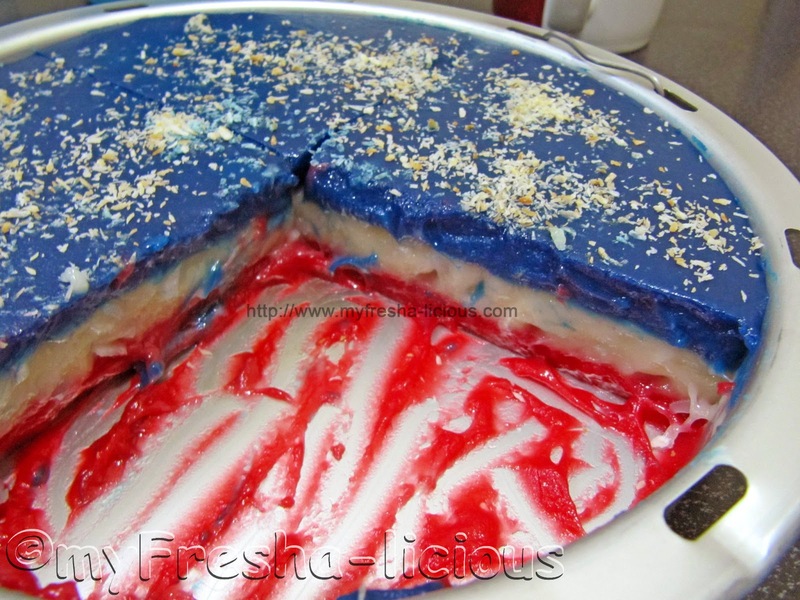 Blue Layer : In one bowl, mix 1/4 tsp of vanilla powder and 1 tsp or more of the blue food color. Pour it in the steaming pan. Steam until it is set.